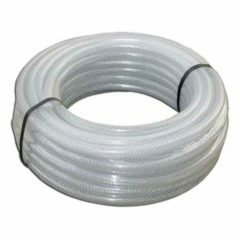 The plastic hose for transporting cooling media (water or glycol) between a CWC cooler and cooled tanks. Inner diameter 19mm, outer diameter 24mm. For cooling systems with fittings M1/2″. The price is calculated for 1 meter. The plastic hose for transporting cooling media (water or glycol) between a CWC cooler and cooled tanks. Inner diameter 25mm, outer diameter 32mm. For cooling systems with fittings M 3/4″. The price is calculated for 1 meter. The foam Mirelon isolation (inner diameter 25mm, outer diameter 37mm) for putting up on a plastic hose with outer diameter 25mm. 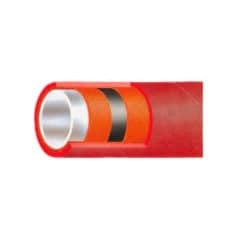 Thermal insulating tubes made of polyethylene foam laminated reinforced PET reflective foil. Thermally conductive, it reflects heat and cold, and it has improved mechanical properties. This isolation is washable and hygienic. The price is calculated for 1 meter. The foam Mirelon isolation (inner diameter 32mm, outer diameter 44mm) for putting up on a plastic hose with outer diameter 32mm. 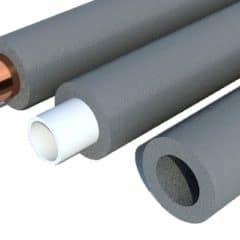 Thermal insulating tubes made of polyethylene foam laminated reinforced PET reflective foil. Thermally conductive, it reflects heat and cold, and it has improved mechanical properties. This isolation is washable and hygienic. The price is calculated for 1 meter. The stainless steel ball valve for the reduction between cooling regulation valve and cooling media plastic hose. Thread M 1/2″ (connection with the regulation valve) and hose barb for hose with inner diameter 19mm. The valve allows manual closing the coolinng channel of the tank during the hose disconnection. Only for water or glycol with temperature from -10°C to +50°C. 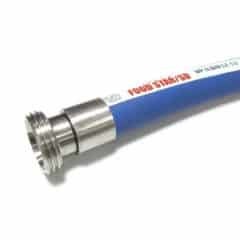 The composite food hose for suction and delivery of beverages such as wine, liqueur, beer, fruit juices, mineral water etc. . Inner diameter 32mm, outer diameter 44mm. The price is calculated for 1 meter. 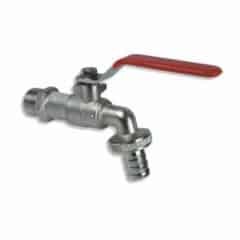 The stainless steel ball valve for the reduction between cooling regulation valve and cooling media plastic hose. Thread M 3/4″ (connection with the regulation valve) and hose barb for hose with inner diameter 25mm. 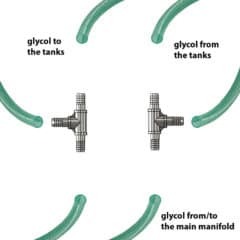 The valve allows manual closing the coolinng channel of the tank during the hose disconnection. Only for water or glycol with temperature from -10°C to +50°C. Suction-delivery hose designed to transfer foodstuffs which demand application of completely odour-free and tastefree rubber. 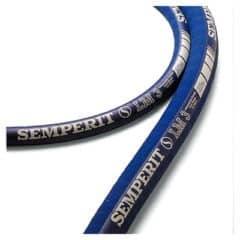 Internal layer compliant with FDA 21 CFR 177.2600, EU Regulations EC 1935/04 and 1012/06. Highly recommended for transfer of milk and dairy products, beer, water, wine, cider and similar beverages. Inner diameter 25mm, outer diameter 35mm. The price is calculated for 1 meter, without fittings (connectors). Suction-delivery hose designed to transfer foodstuffs which demand application of completely odour-free and tastefree rubber. Internal layer compliant with FDA 21 CFR 177.2600, EU Regulations EC 1935/04 and 1012/06. Highly recommended for transfer of milk and dairy products, beer, water, wine, cider and similar beverages. Inner diameter 32mm, outer diameter 42mm. The price is calculated for 1 meter, without fittings (connectors). Suction-delivery hose designed to transfer foodstuffs which demand application of completely odour-free and tastefree rubber. Internal layer compliant with FDA 21 CFR 177.2600, EU Regulations EC 1935/04 and 1012/06. Highly recommended for transfer of milk and dairy products, beer, water, wine, cider and similar beverages. Inner diameter 40mm, outer diameter 51mm. The price is calculated for 1 meter, without fittings (connectors). The compact manifold CWC-CMC212 is designed to connect 2 cooling zones on cooled tanks to your cooling unit using flexible plastic pipes with inner diameter 19mm, saving you the cost of a fixed piping installation at the first stages of starting your winery or your brewery. The compact manifold CWC-CMC234 is designed to connect 2 cooling zones on cooled tanks to your cooling unit using flexible plastic pipes with inner diameter 25mm, saving you the cost of a fixed piping installation at the first stages of starting your winery or your brewery. 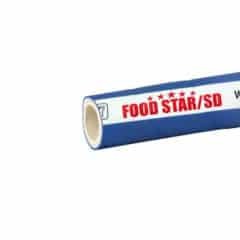 Suction-delivery hose designed to transfer foodstuffs which demand application of completely odour-free and tastefree rubber. Internal layer compliant with FDA 21 CFR 177.2600, EU Regulations EC 1935/04 and 1012/06. Highly recommended for transfer of milk and dairy products, beer, water, wine, cider and similar beverages. Inner diameter 63mm, outer diameter 76mm. The price is calculated for 1 meter, without fittings (connectors). The compact manifold CWC-CMC312 is designed to connect 3 cooling zones on cooled tanks to your cooling unit using flexible plastic pipes with inner diameter 19mm, saving you the cost of a fixed piping installation at the first stages of starting your winery or your brewery. The compact manifold CWC-CMC334 is designed to connect 3 cooling zones on cooled tanks to your cooling unit using flexible plastic pipes with inner diameter 25mm, saving you the cost of a fixed piping installation at the first stages of starting your winery or your brewery. 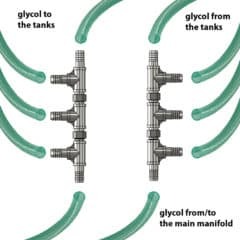 The compact manifold CWC-CMC412 is designed to connect 4 cooling zones on cooled tanks to your cooling unit using flexible plastic pipes with inner diameter 19mm, saving you the cost of a fixed piping installation at the first stages of starting your winery or your brewery. 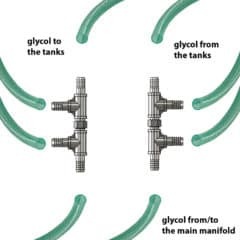 The compact manifold CWC-CMC434 is designed to connect 4 cooling zones on cooled tanks to your cooling unit using flexible plastic pipes with inner diameter 25mm, saving you the cost of a fixed piping installation at the first stages of starting your winery or your brewery.